If Your Church, Synagogue or Institution is Ready to Restore Stained Glass Windows, the Model RFQ and RFP for Stained Glass Releading and Restoration are “Must See” documents. Rohlf’s Stained and Leaded Glass Studio adheres to the SGAA guidelines in every aspect of our business restoring stained glass windows. In fact, we helped write the book! 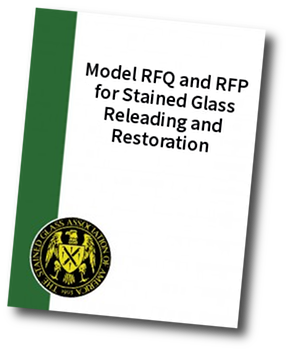 Get your free, no obligation copy of the SGAA Model RFQ and RFP for Stained Glass Restoration. Get your FREE SGAA Model RFQ and RFP forms here.